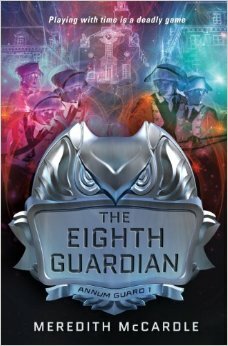 Happy Book Birthday to THE EIGHTH GUARDIAN! Today is another big book birthday! Meredith McCardle’s THE EIGHTH GUARDIAN is out today! Doesn’t that sound awesome? I have been waiting to read this book FOREVER. Supposedly my preordered copy is supposed to arrive tomorrow. Crossing fingers. Meredith been such an amazing and supportive friend through this whole publishing process and I’m just thrilled about her book releasing! To keep up with all that Meredith is doing, check her blog here. Plus if you live in South Florida, she’s hosting a book launch on May 13th! One Response to Happy Book Birthday to THE EIGHTH GUARDIAN! Woohoo!! Thank you so much, Christina! !